Layout uses one Master Starter Project. If you’ve downloaded it recently, chances are you don’t need to re-download it. Click here to download the Layout Master starter project. Open up the Layout_ToyBoxx.uproject and begin your adventure! This lesson will introduce characters that move. At long last, you can navigate your levels! Before we begin, it’s important to remember that movement in virtual reality can cause sickness if not done carefully. Comfort depends on the relationship between character locomotion and camera perspective. A good character-camera relationship can only come from diligent testing. Wear your headset! Virtual reality requires us to think differently about movement and perspective. We believe our mechanics adequately mitigate simulation sickness, but there’s a great opportunity to innovate here. Don’t hesitate to create whatever characters that work best in your experiences. This talk by Oculus’ Richard Yao is a great introduction to the perceptual system and HMDs. Let’s begin with simple first-person movement. This character will move and rotate in the world freely. The camera will be attached in the position of the character’s “head”. We generally don’t recommend this kind of character movement because it invariably leads to some sickness. We do, however, appreciate that players find this kind of movement intuitive, so we’ll cover some best practices below. Simulation sickness is often the result of conflict between the visual perception of movement and the non-visual perception of movement. 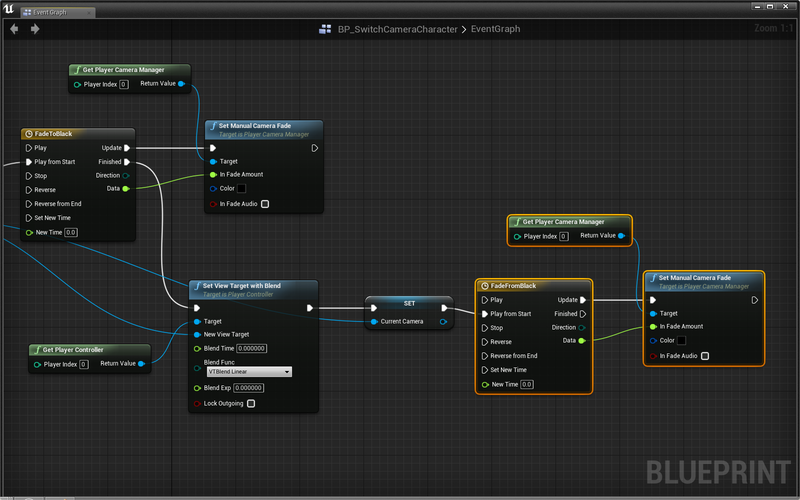 We can create a new character with UE4’s Character class. 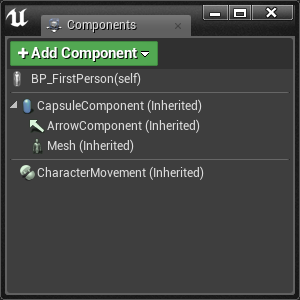 The inherited CharacterMovement component allows us to easily move our character after adding some inputs and basic movement code. The root CapsuleComponent acts as our player’s collision box. It’s already set to the recommended height of 176cm and width of 68cm. 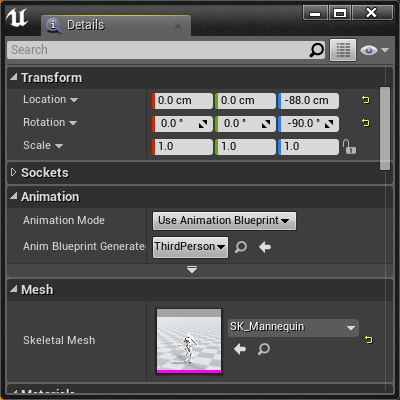 We can add a skeletal mesh to the Mesh component to define the character’s appearance and animations. Let’s add a camera to the character via a scene component. This option turns the character to face the direction your HMD is facing. This was introduced in 4.11 and does not play well with the Use Pawn Control Rotation option. We will use it later in the lesson. Attach it to CameraRoot by dragging the camera component on top of the camera root component. The UE4 VR Best Practices Guide recommends setting the eye height of a first person character to 160cm. The first person character guidelines are written to replicate reality. 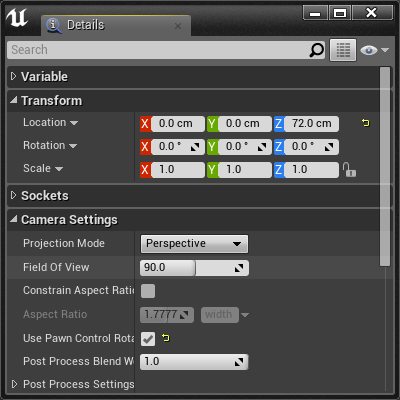 UE4 recommends the player have an average human height, width, and camera (eye) location. 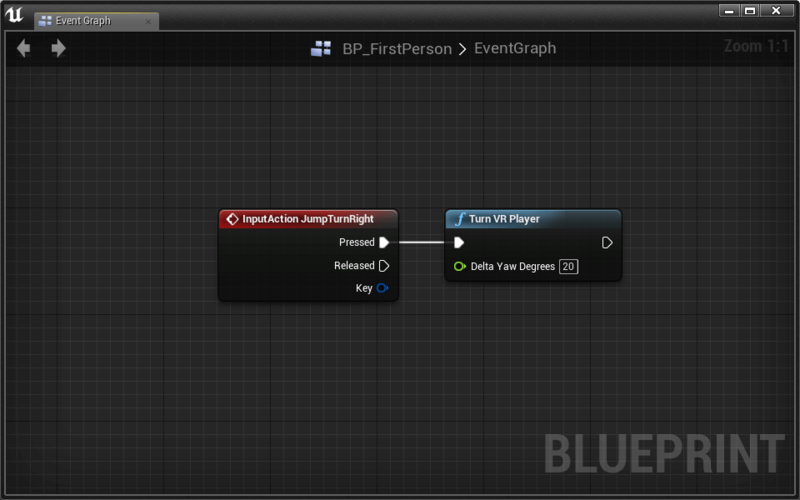 When the level is played, a BP_FirstPerson character will spawn. 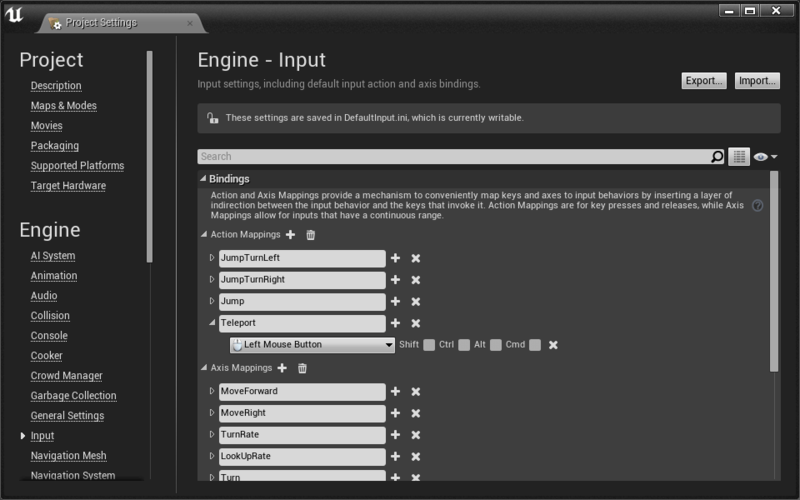 We can capture user input for movement behavior with Axis and Action Mappings. Action Mappings capture binary input, like key presses. 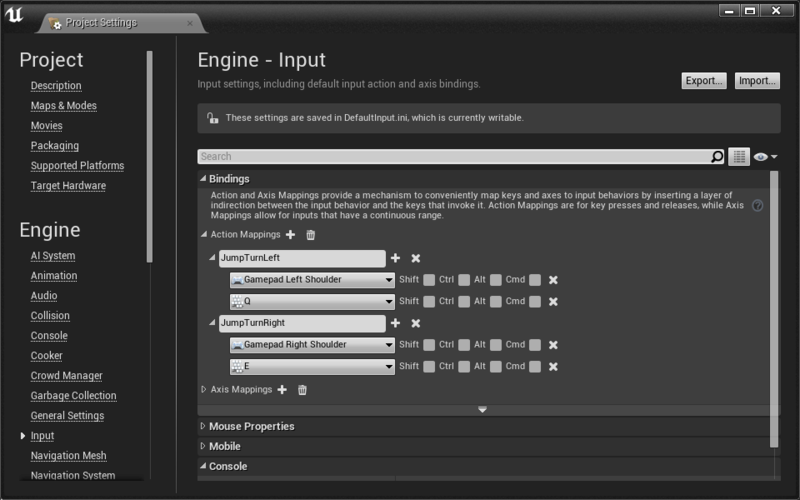 Axis Mappings capture continuous input, like mouse movement. Notice that Scale is set to -1.0 for inputs that move the character in the “opposite” direction (in this case backward or left). There is an important difference between TurnRate/LookUpRate and Turn/LookUp. Gamepad and keyboard input is represented with axis values between -1 and 1. Mouse input is represented with values between ∞ and -∞. 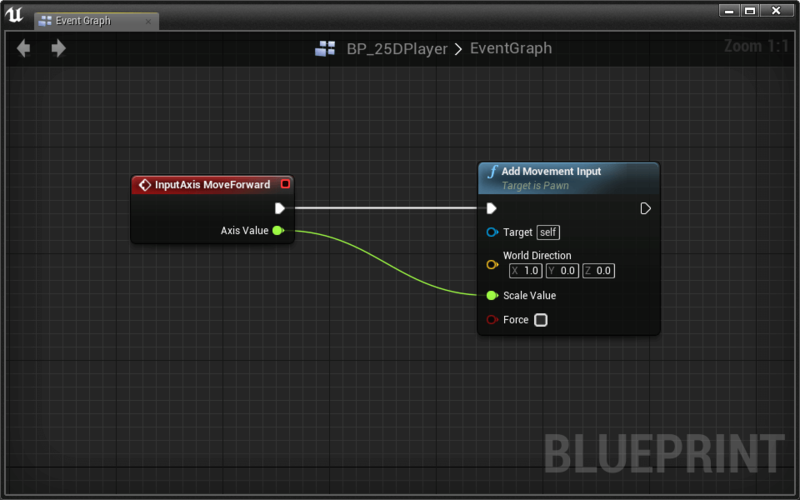 We’ll handle both types of input in our movement script. The character can now move forward, backward, left, and right using the W A S D keys, arrow keys, or gamepad left joystick. UE4 recommends slow movement speed in VR. 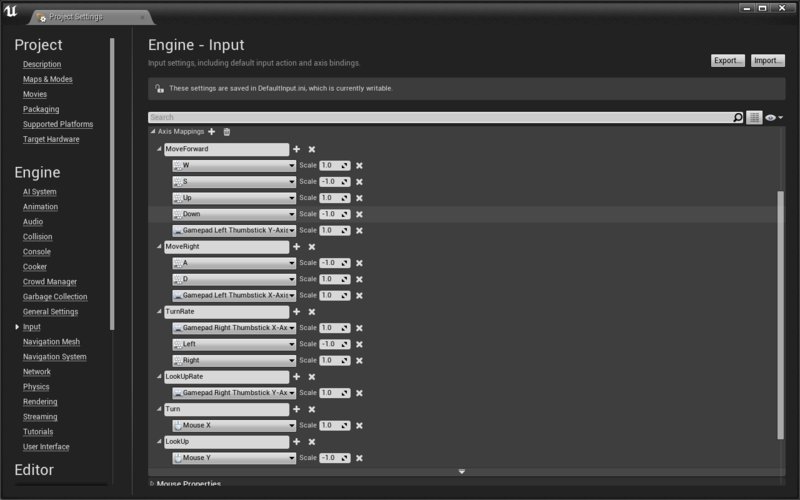 We can set a lower speed in the CharacterMovement component details panel. We can set other character movement options in the CharacterMovement details panel. We can also set these variables in code. 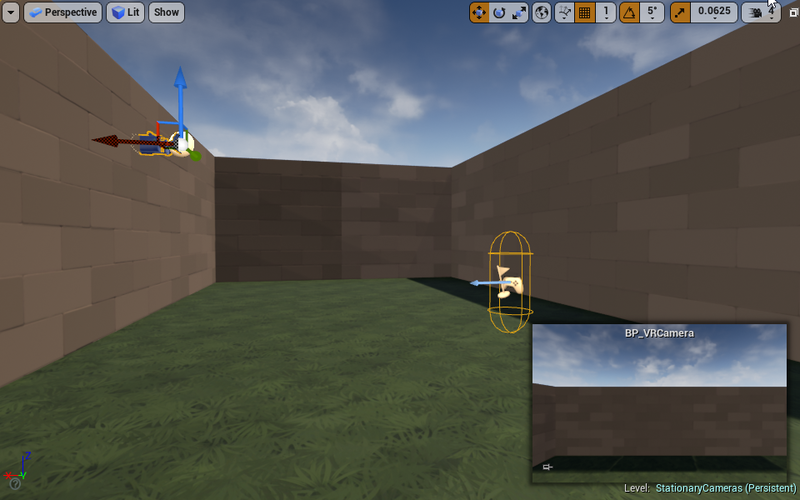 Let’s add code to allow the player to look up outside of VR. Notice that pitching up and down is automatically disabled for VR comfort. 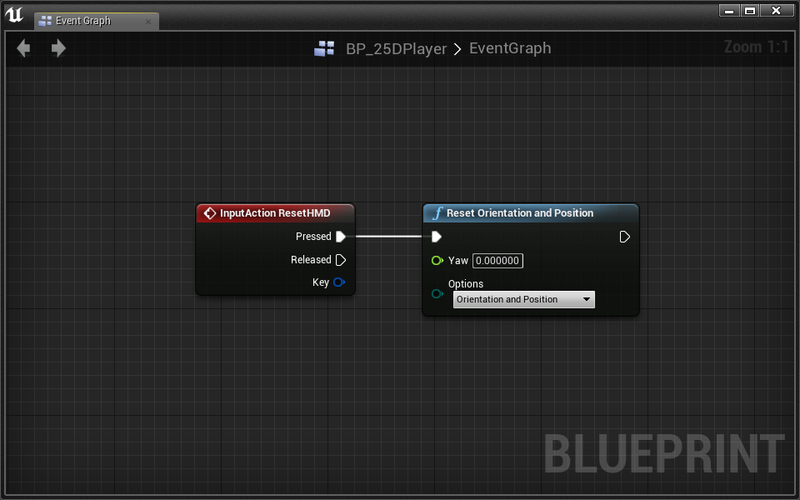 These variables will be used to set how quickly the gamepad and keyboard change the player’s view. Now we use Axis Value to calculate the amount to turn the player. Connect TurnRate > Axis Value into one of the multiplication inputs. Connect our variable Base Turn Rate into one of the other multiplication inputs. Place a Get World Delta Seconds and connect it to the last multiplication input. We multiply rotation by Get World Delta Seconds so that speed does not change with frame rate. Connect LookUpRate > Axis Value into one of the multiplication inputs. Connect our variable Base Look Up Rate into one of the other multiplication inputs. We now have full control of the character’s movement in and out of VR. Watch out! You might experience some discomfort when rotating with the mouse or joystick. Some viewers find that mouse rotation is more comfortable than joystick rotation. Research suggests that the mouse provides a grounded reference that the joystick cannot provide. It’s believed that this reference helps the viewer better anticipate and conceptualize orientation. Neat! If the visual perception of rotation causes pain, we can simply skip rotation with a jump turn. Sometimes called a skip, the jump turn allows the player to rotate in discrete radial increments. Use Q and E or a gamepad’s shoulder buttons to jump left and right. It can take some getting used to, but many find the jump helps reduce simulation sickness. Feel free to change the Turn VR Player > Delta Yaw Degrees amount to find a rotation that feels best. Jumping is generally not advisable for VR, but some experiences call for jumps. We’ve provided a jump action mapping with two inputs: Gamepad Face Button Bottom and Space Bar. 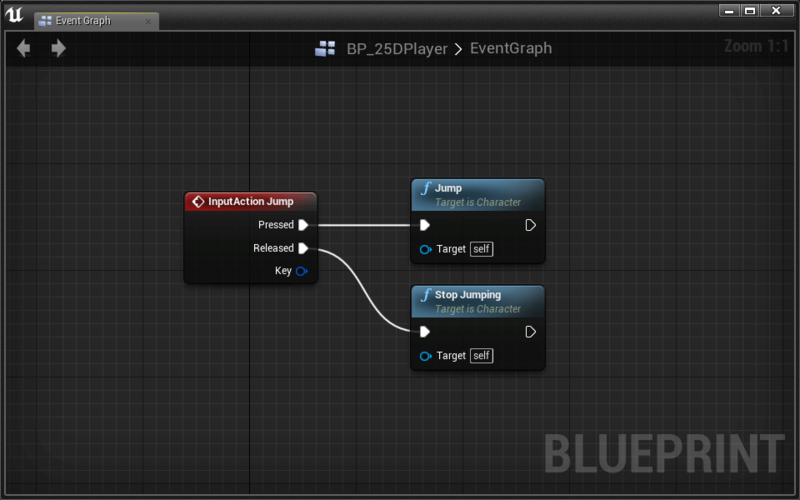 The Jump and Stop Jumping nodes come with the Character class and provide everything we need to make the player jump. Test it out! 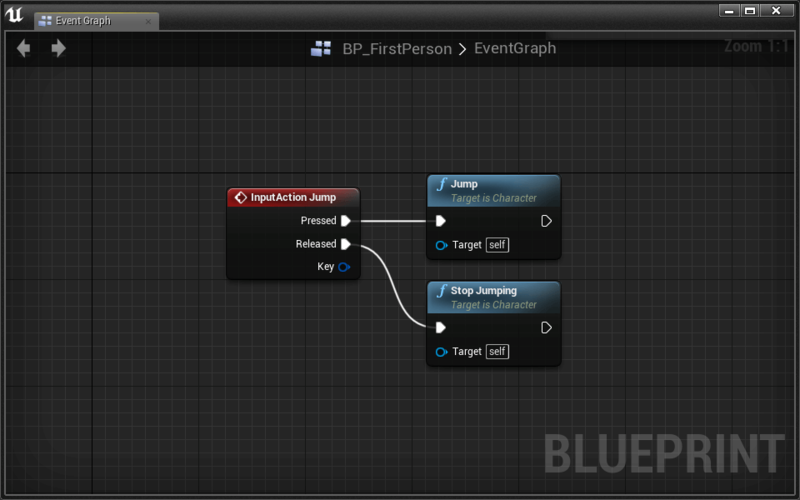 You can modify how your player jumps in the CharacterMovement component details panel. Congratulations! You now have a fully functional First Person character that is able to walk and jump in first person. As with rotation, locomotion can lead to simulation sickness. We can skip this movement with teleportation. 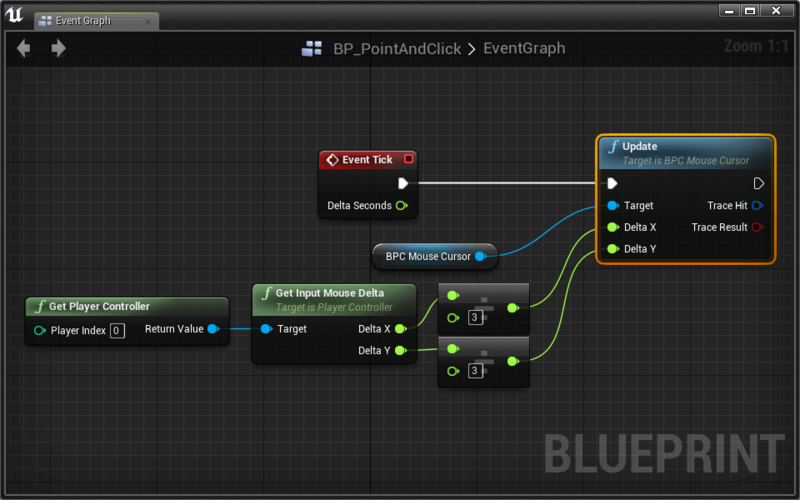 Let’s create a mouse cursor that we can target as a teleport destination. The BPC_MouseCursor requires you to call its Update function whenever you want to move the mouse. Let’s hook up our mouse movements to this node. The BPC_MouseCursor is a component that acts as a wrapper for Layout’s BP_MouseCursor. The BP_MouseCursor projects a 2D mouse position into 3D space and places a reticle at that location. 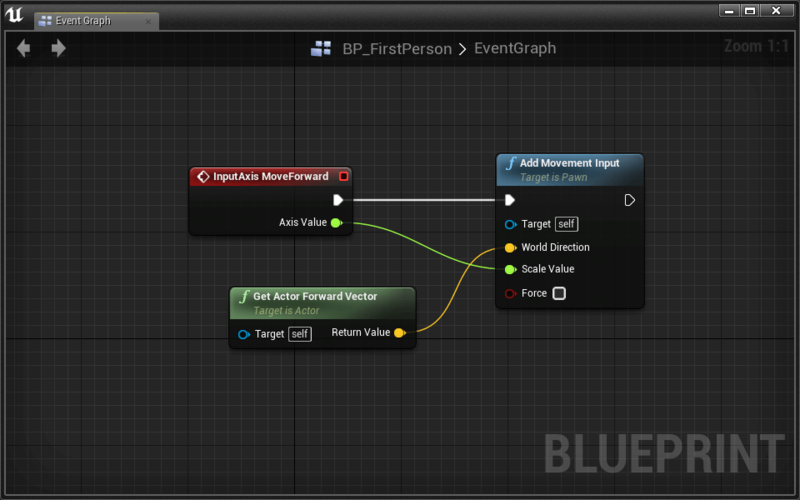 If you’re curious how it is implemented, check out the BP_MouseCursor in Blueprints > Utility. The Update node has two inputs for the cursor’s Delta X and Delta Y. We’re going to use the mouse movement for these inputs, but they could easily be gamepad or key inputs as well. Try it out! When you move your mouse, you’ll see a cursor in the world in 3D space. The cursor’s default behavior is to remain in its location until the mouse moves. At that point, if the cursor is off screen it will recenter itself. Change the Update > Delta X and Update > Delta Y inputs so that the cursor moves at 1/3 its current speed. The Update function outputs a Trace Hit and a Trace Result as well. We will use these a bit later to decide if we can teleport to that location. Let’s first get teleporting to work! 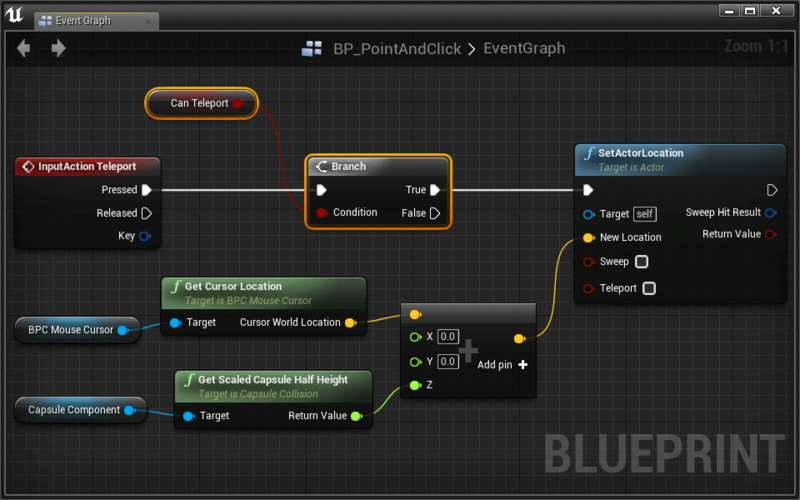 A teleport action mapping is already set in the Action Mappings of your project with an input of Left Mouse Button. We need the cursor’s location. To avoid clipping through the ground, we need to set the character’s new location slightly above the location of the cursor. We can do this with some simple math. By splitting the struct pin, we can add just to the Z without creating a new vector. Let’s add the exact amount we need in the Z direction. That amount would be half the root CapsuleCompoent’s height. Test it out! You should be able to teleport wherever you click. This isn’t always a good thing. We should only teleport where the player can stand. We’re going to set this variable depending on whether or not the cursor is in a location that we can teleport to. 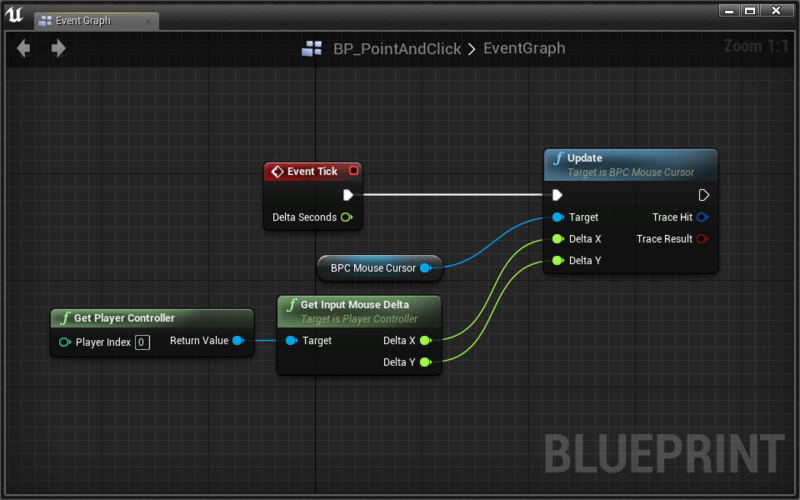 Go back to your BPC Mouse Cursor > Update node. 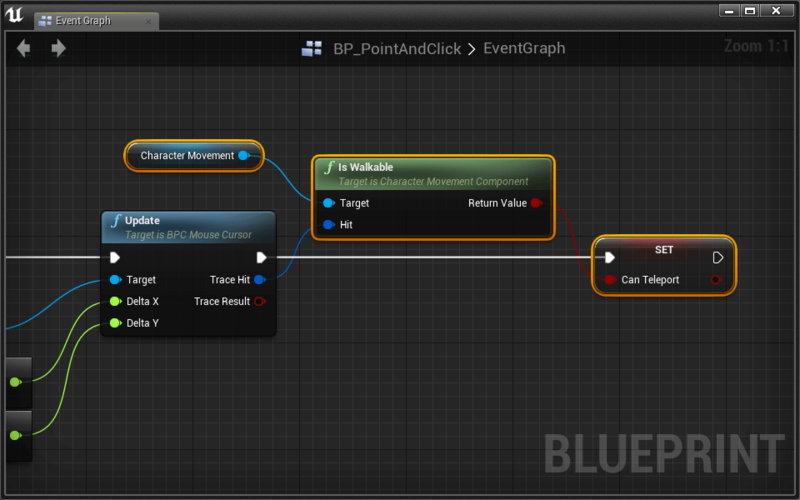 Pull a wire from Update > Trace Hit and place an Is Walkable (CharacterMovement) node. Use the new Can Teleport variable and a Branch to only teleport when able. Use this knowledge to set the cursor’s color to indicate whether or not the player can teleport. Sweet! This is a cool way to get around. Our character can’t turn without a VR headset. Let’s add a new mechanism for turning your player. 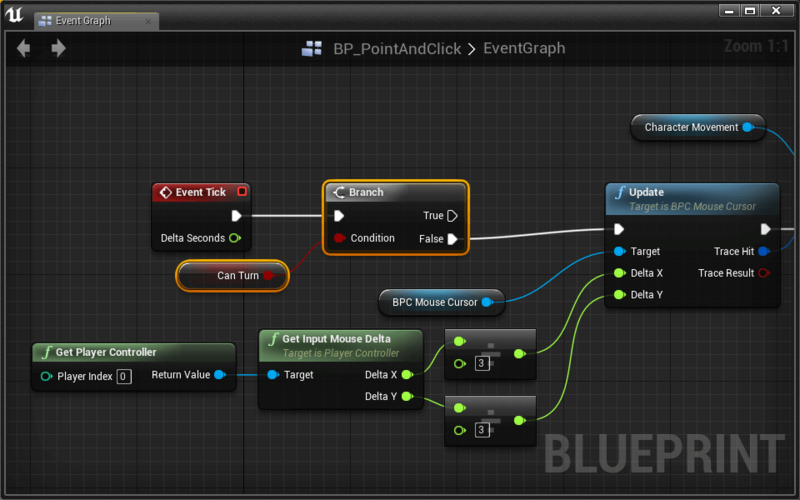 The mouse jump turn is the jump turn with mouse input. To execute a mouse jump turn, the player will press Right Mouse Button and move the mouse left or right. After moving the mouse some set amount, the character will do a jump turn. Here we need to think about how this will work. The idea is that once we move the mouse enough, we will make a Jump Turn. In order to keep track how much our mouse has moved since we pressed the Right Mouse Button, we need to create a new variable. If Turn Mouse Delta becomes greater than 5, use Turn VR Player to turn the player right. Similarly, if Turn Mouse Delta becomes less than -5, use Turn VR Player to turn the player left. Don’t forget to set Turn Mouse Delta back to 0 after turning the player. Test it to see that it works! Great! One thing you may notice when you test is that the cursor acts strangely when we turn with the mouse. Let’s only Update the cursor when we’re not turning. Perfect! Now we can turn and teleport with the mouse. Play around in the world to get a feel for this movement scheme. We’ve created two characters in the first person perspective, but this isn’t the only character-camera relationship that works well in VR. Let’s create a new character from the third person perspective. The character will move in what’s called a 2.5D environment. 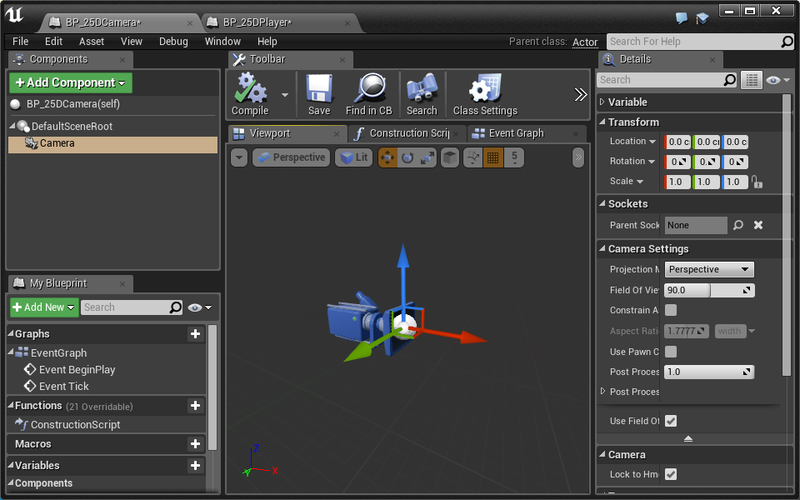 The camera is constrained to a plane as the character moves. We’ve designed a level to take advantage of this constraint. Since we’ll be in Third Person, we can’t use an invisible character. 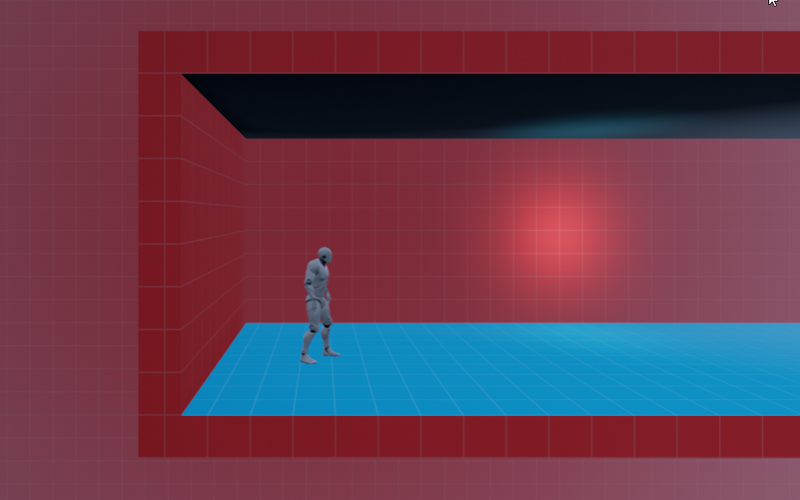 With Skeletal Mesh and associated Animation Blueprint, our player has become a running humanoid. Until now, we haven’t needed to enable the Lock to Hmd setting of the camera component. 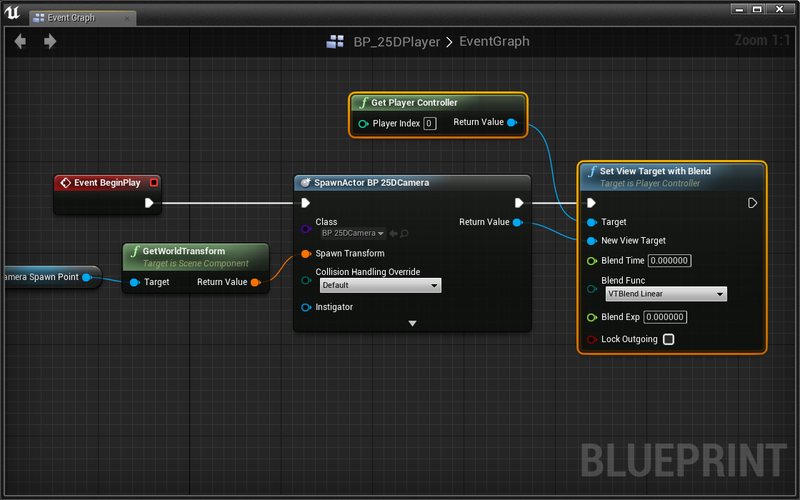 Because the player does not “own” the camera, Lock to Hmd should be enabled to ensure that BP_25DCamera tracks head movement. In order to possess the external camera, we have to spawn it in the world, then explicitly make it our main camera. First, lets designate a place to spawn our camera. We need to make sure our Camera spawn facing the right direction. A great way to do this is with an Arrow Component. 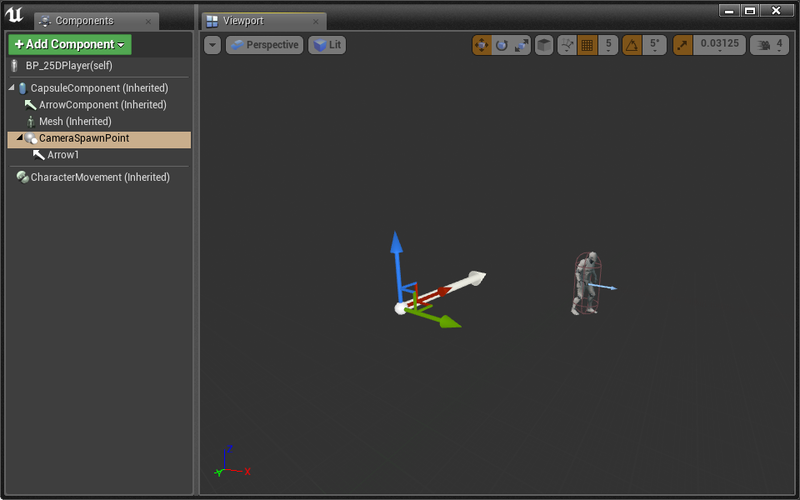 Now we have an arrow that shows the forward direction of the component it is attached to. The arrow component is usually only used for development so it will not show up in the game unless you explicitly tell it to. It looks like we have to rotate our CameraSpawnPoint to point towards our character. 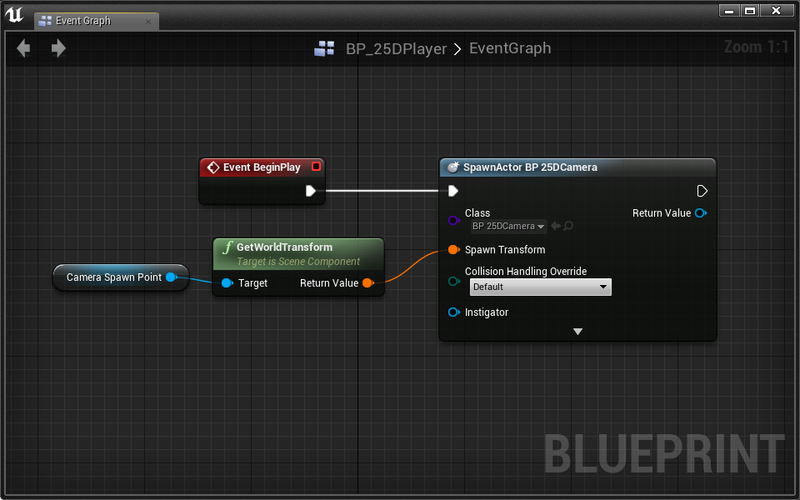 Now that our CameraSpawnPoint is set up, let’s use its transform to properly spawn our BP_25DCamera. When the game begins, spawn the BP_25DCamera using the CameraSpawnPoint’s world transform. 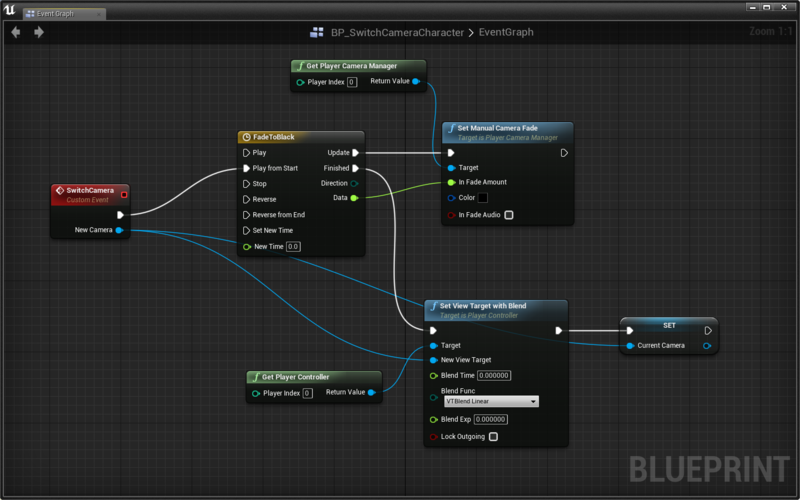 The Set View Target with Blend node takes any actor as its New View Target and possesses its camera. 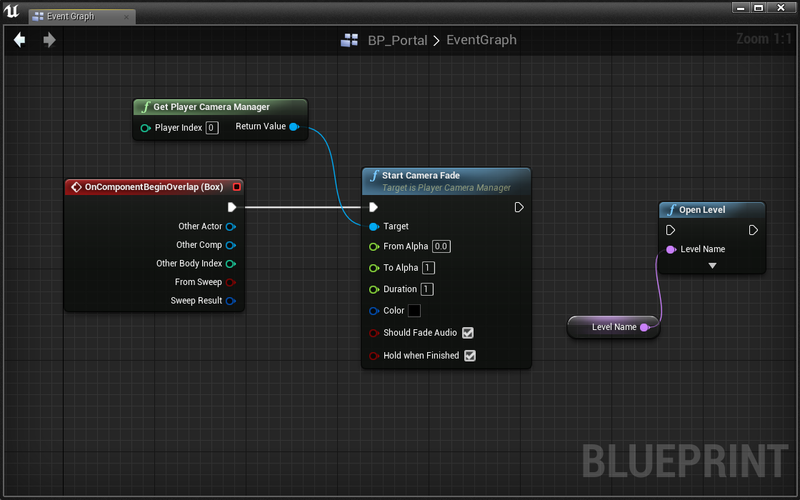 We’ve now set our camera to the BP_25DCamera actor that we spawned. Go ahead and press Play to test it out. Make sure to test it monoscopically and in VR. We’ve got a static 2.5D camera set up. Before we program our camera to follow the player, lets program our player to move! For the First Person perspective we used the character’s right vector as the World Direction, but that’s not the case here. Instead, we want to move the character along the Y axis. Great, now we can move left and right! 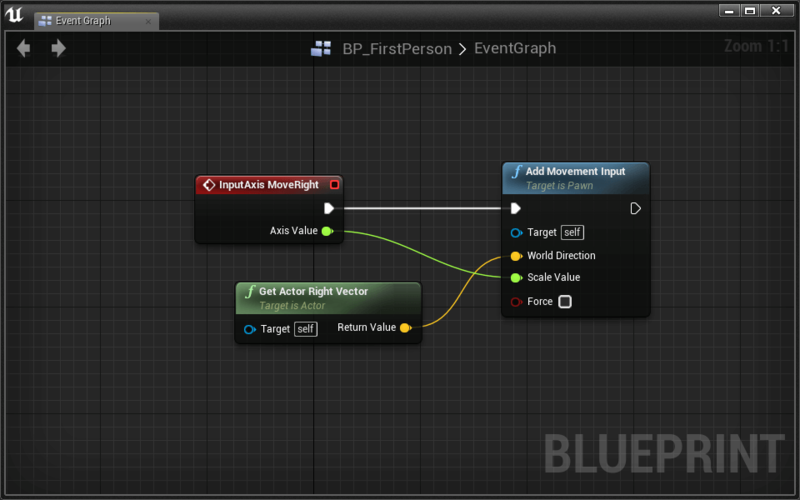 Set up the InputAxis MoveForward event to move the character along the X axis. Test it out. Everything works, but the character doesn’t run in the direction it moves! Now your player should run around the way you expect. For fun, add the ability for your character to Jump. You already did this for the First Person perspective. Now that we can move, it’s time to follow the player with our BP_25DCamera. The Camera X Location is the camera’s original X location in the world. We need this to constrain our camera to the X Axis. The Camera Offset is the camera’s relative offset from the player. Take your time to think about the math, then make it happen! Your challenge is to write the code to get the camera to follow the player in a 2.5D fasion. Warning: this challenge is not trivial. Give it some time before you decide you can’t do it. 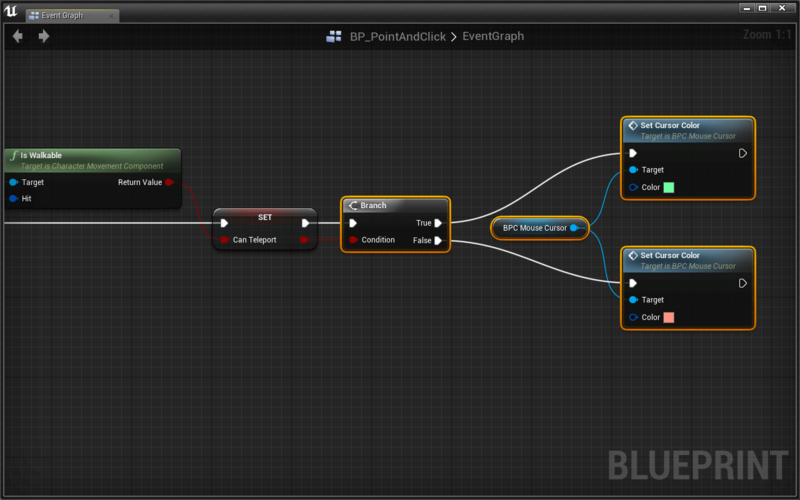 Hint: You need to use Split Struct on your vector pins and/or a Break Vector node to isolate X, Y, and Z values. Our camera makes no attempt to smooth movement. With the Spring Arm component, we can to dampen sudden changes in location. A Spring Arm is like a flexible camera boom. As the boom moves, an attached camera will slowly accelerate to follow. The camera will automatically attach itself to the “end” of the arm. We set the flexibility of the Spring Arm with the Camera Lag setting. 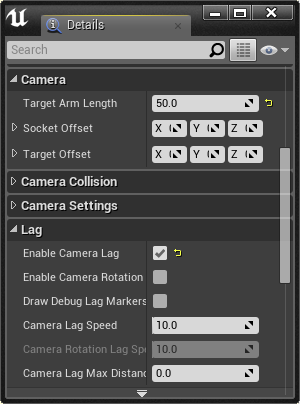 You can adjust the amount of camera lag using the Camera Lag Speed option. Tweak your Spring Arm settings until you’re comfortable! Many third person VR experiences take place in small environments. When the world is small, players move greater distances with positional tracking. The effect this has on immersion is better experienced than explained. With one setting, we’ve scaled environment elements to 1/5 their normal size. We’ve also effectively increased the virtual interpupilary distance. Commonly referred to as IPD, interpupulary distance is the distance between a person’s eyes. As this distance increases, viewed objects appear smaller. It’s useful to reset a player’s orientation and location relative to the virtual environment. 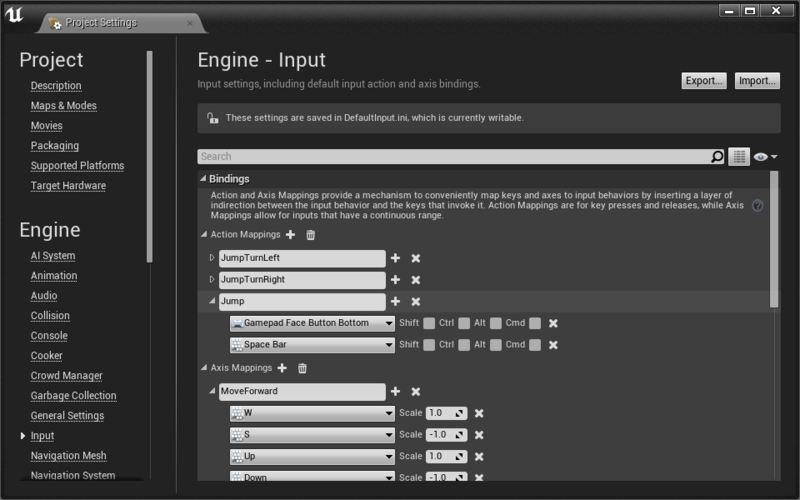 We’ve added an Axis Mapping called ResetHMD that fires on Tab and Gamepad Special Left. Beautiful! Now whenever you press Tab or Gamepad Special Left, your HMD’s origin will be reset. We can disable player movement entirely with stationary cameras. As a character moves through the level, we can automatically switch the player between perspectives for the best point of view. We’ve colored the camera trigger boxes pink in this video, but they’ll be invisible in your game. Place a BP_VRCamera somewhere in the world facing the PlayerStart. We need it facing player start so we can see our character when we play the game. When you place your BP_VRCamera, make sure to not rotate its pitch. We’ll demo why at the end of this section. If you press play now, you won’t get good results. The problem is that we haven’t possessed our new camera. 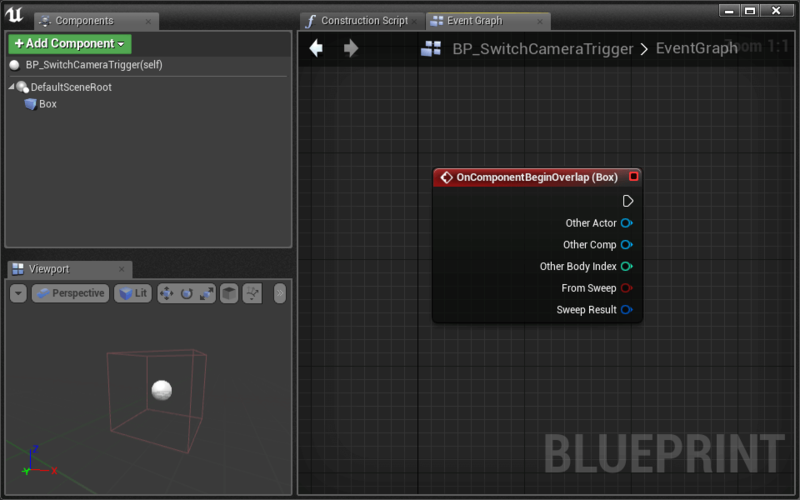 Open the BP_SwitchCameraCharacter which has been premade for you with basic movement and jumping mechanics. Remember, the Set View Target with Blend is what sets our new camera perspective. It takes any actor as its New View Target and possesses its camera. 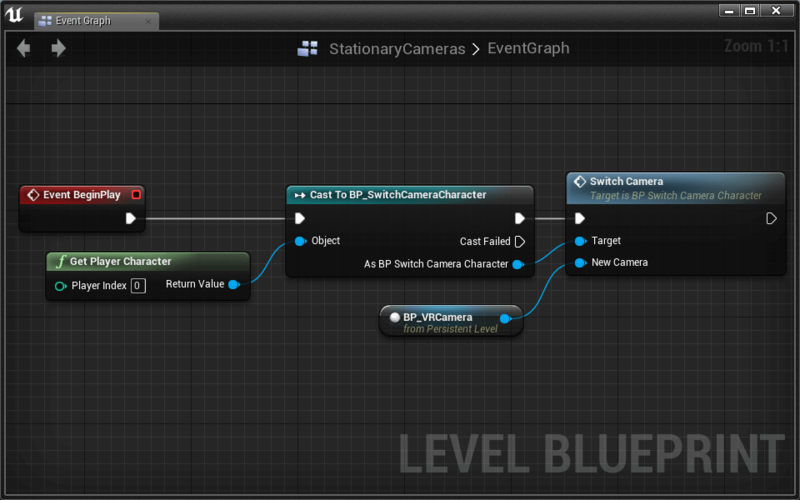 The last thing we need to do is fire our new SwitchCamera event from the level blueprint. 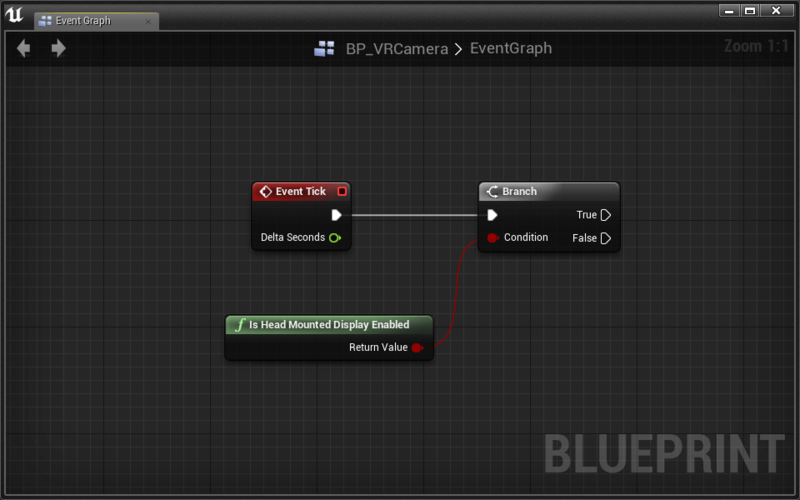 Get a reference to the BP_VRCamera you placed earlier. 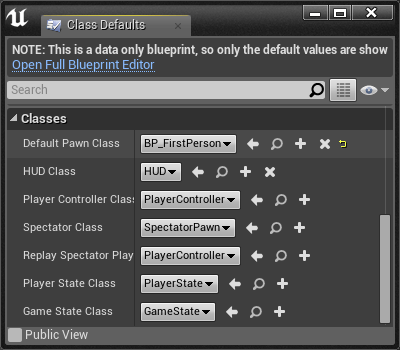 Do this by selecting the BP_VRCamera in the world and then right clicking in the Level Blueprint and select Create a Reference to BP_VRCamera. We mentioned that you should never pitch cameras in VR. Don’t believe us? Go ahead and try it for yourself! Set the pitch rotation of BP_VRCamera to something other than 0 and test in VR. We need to enable automatic camera movement when the player is not in VR. The strategy is simple: every frame, we update the camera’s rotation to point toward the player. 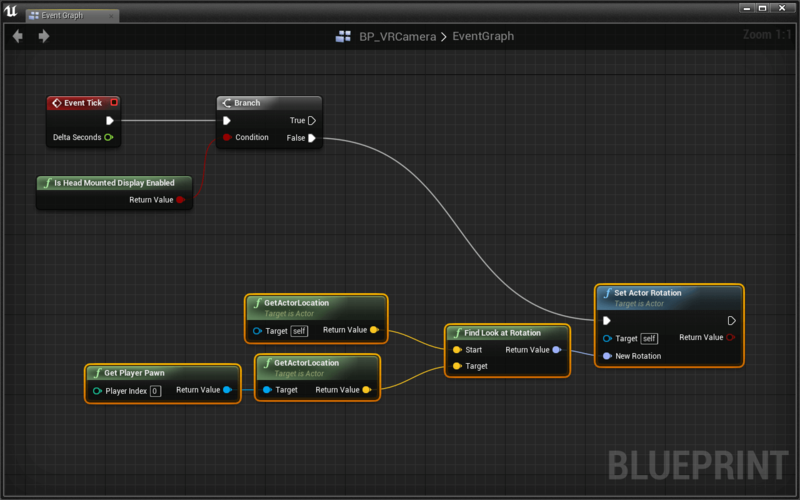 Rotate BP_VRCamera to follow the player character every frame. Only rotate if the HMD is not enabled. 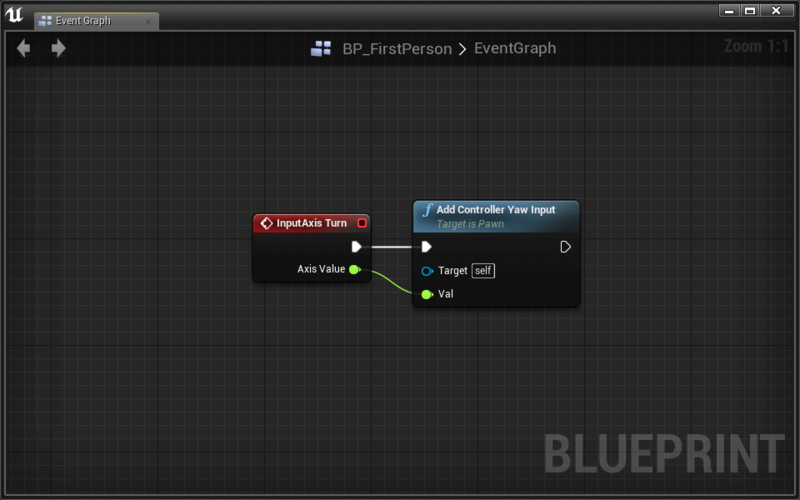 To set BP_VRCamera’s rotation, use the Set Actor Rotation node. 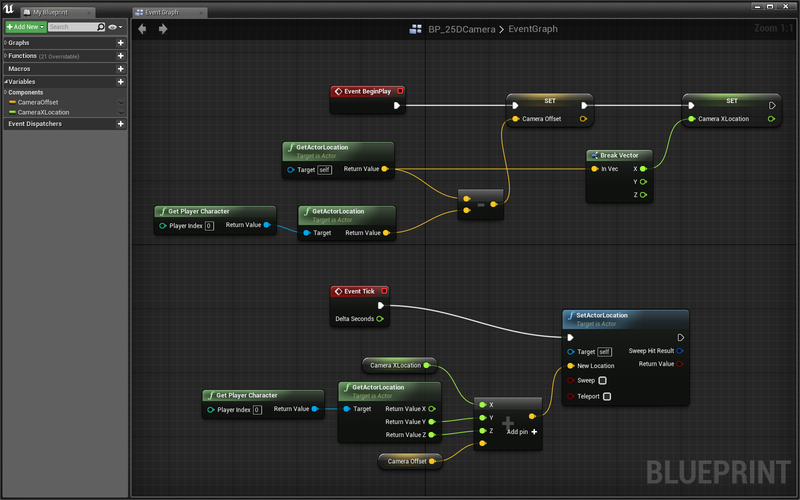 To calculate the proper rotation for the camera, use the Find Look at Rotation node. You’ll want the rotation from BP_VRCamera to the player. 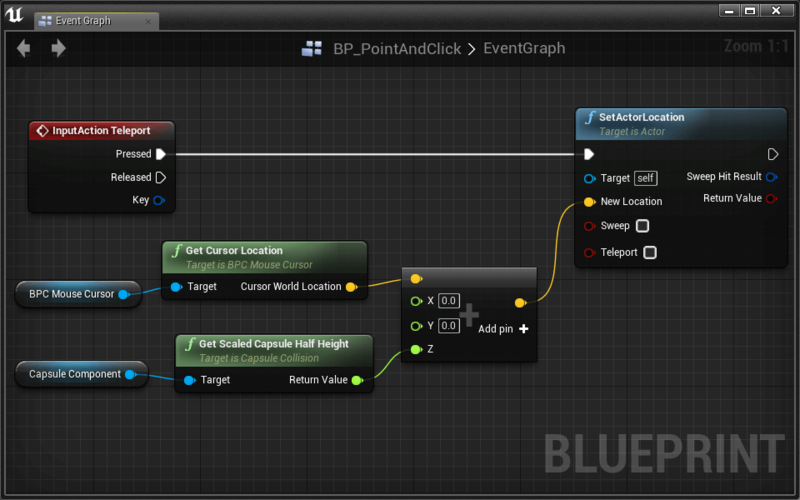 To get the BP_VRCamera’s location, use the Get Actor Location node. Test without the HMD. The camera should follow the player character wherever it goes. Thanks to Lock to Hmd, our camera automatically works in VR. This means we don’t have to execute anything on false. We now have a possess-able camera actor that works both in and out of VR. One thing you may notice, controlling the character feels strange. Let’s see what we can do to make it feel more natural. 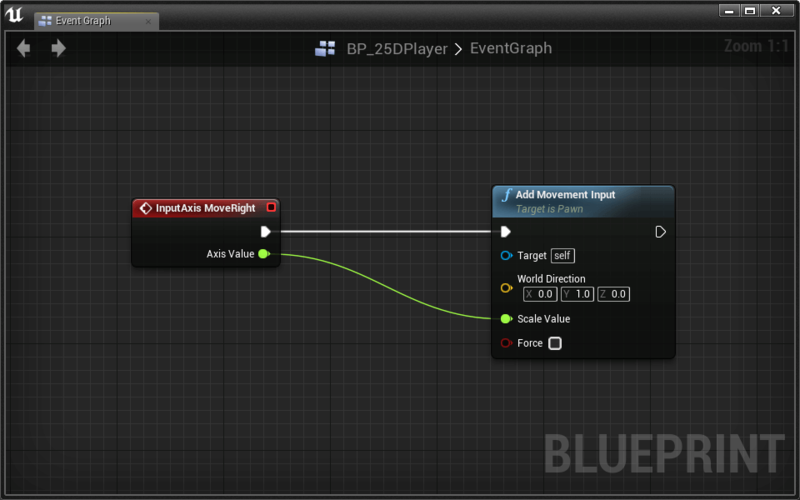 Currently, the movement code is using hard coded World Direction values. Let’s see how it feels to use the forward and right vectors of our current camera. To start, we have to store our current camera. We need to get the camera’s forward and right vectors as input for the World Directions in our movement code. Test it out! Moving around should feel better. There is one difficult-to-spot bug in this code. If you look down while wearing your HMD, your player will run slower. This is because your camera’s forward vector starts pointing downward, which makes your player character try to run downwards too. To fix this, we need to ignore the Pitch and Roll of the camera’s rotation. We only want the Forward and Right Vectors from the camera’s Yaw rotation. 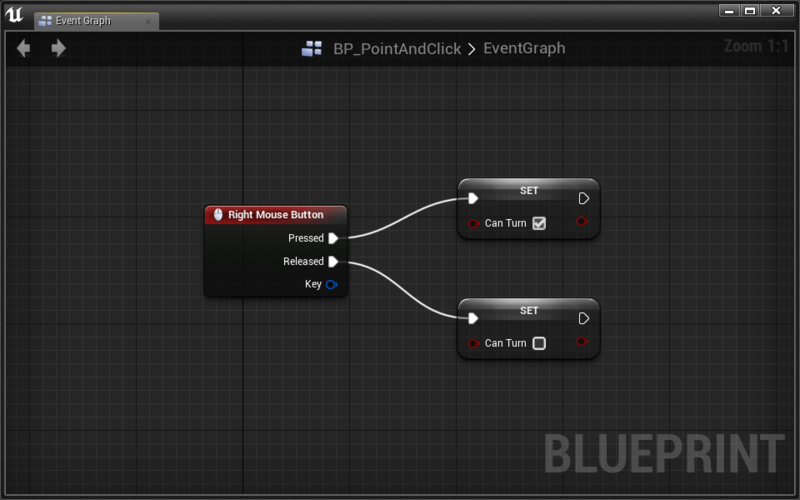 Pull a wire from CurrentCamera and place a Get Actor Rotation node. We’ve now isolated the Yaw rotation of CurrentCamera. 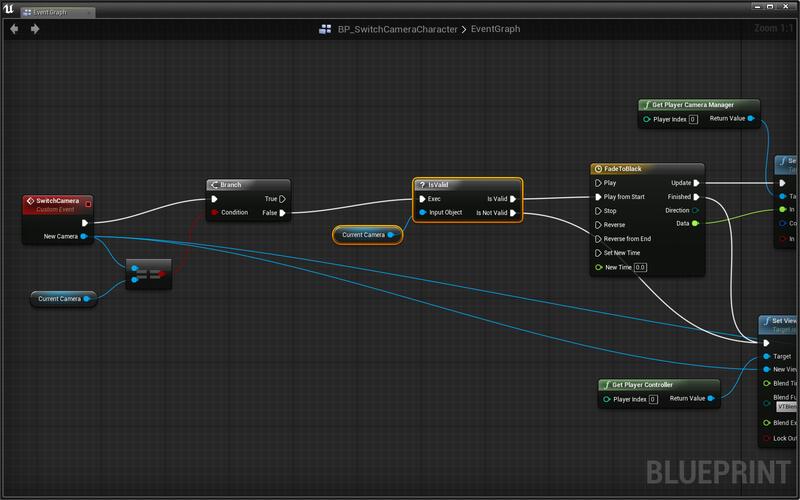 Pull a wire from Make Rotator > Return Value and place a Get Forward Vector node. 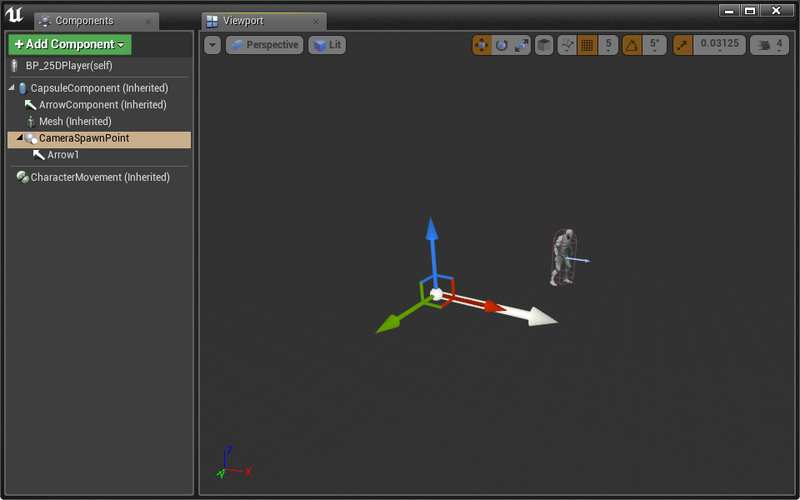 Connect the Forward and Right Vectors into the correct Add Movement Input nodes. Let’s add new cameras to the level and switch between them. 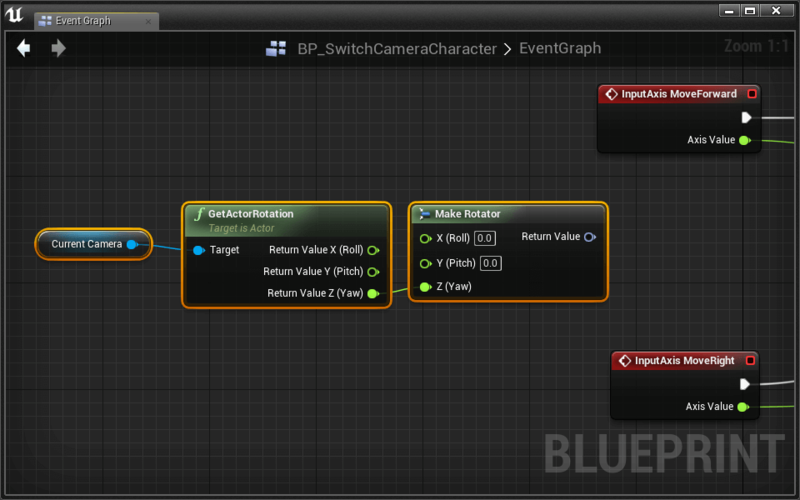 This trigger will work by telling BP_SwitchCameraCharacter to SwitchCamera when the player overlaps the trigger. This means the trigger needs to store a reference to the new camera actor. By making this variable Editable (more commonly known as Public), we can change its value from within the editor. Place a second BP_VRCamera somewhere in your world. Place a BP_SwitchCameraTrigger where you think appropriate. When your player character runs into it, imagine switching to your new camera view. In the details panel, select the proper Target Camera from the drop down. You want to choose the camera that your player’s view will change to when overlapping the trigger box. 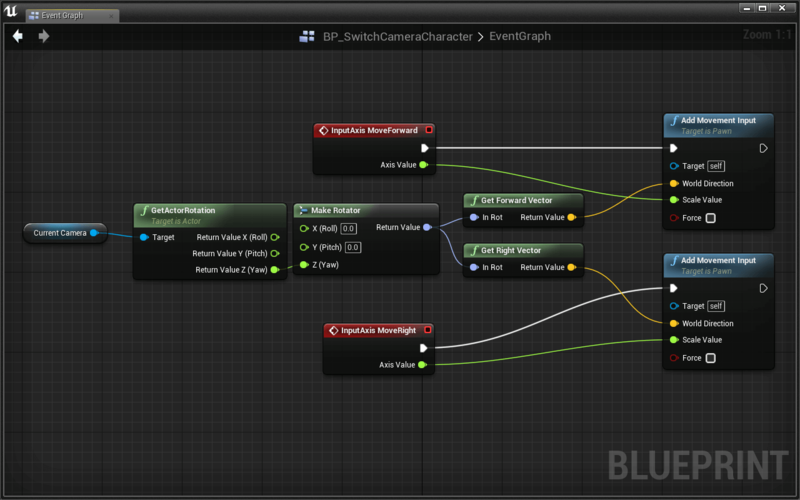 When the BP_SwitchCameraTrigger is overlapped, we want to check if it was the player that overlapped, then call SwitchCamera if it was. Switch the camera to the trigger’s Target Camera. 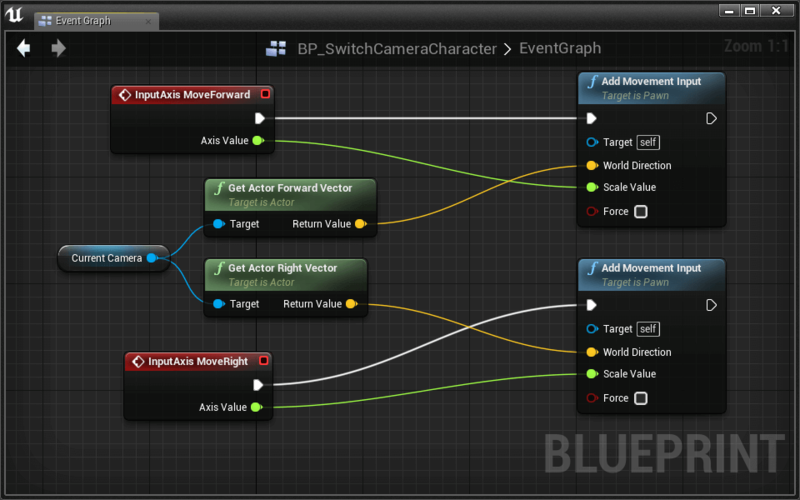 Use Cast to BP_SwitchCameraCharacter to check if OnComponentBeginOverlap (Box) > Other Actor is actually the player character. Switching cameras is now fully functional. 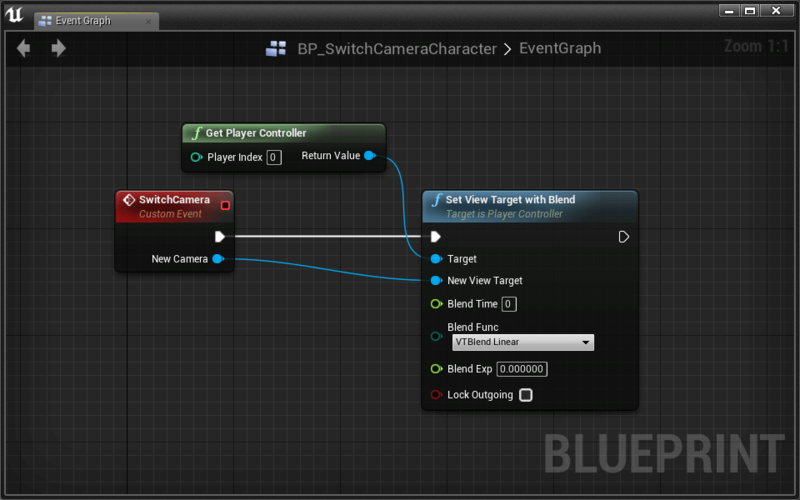 It’s up to you to place more BP_VRCameras and their associated BP_SwitchCameraTriggers throughout the level. Fading between cameras can improve comfort. We’ll use a timeline and Set Manual Camera Fade. We’ll make our fade wrap around the SwitchCamera event. When the event fires, we’ll fade the scene out, switch cameras, then fade back in. Now we need to use our timeline’s output to fade the scene to black. We now fade to black, then switch the camera. All we have to do is fade back in! Using the same techniques we used to fade the camera to black, write some code to fade the camera back in after switching to the new view target. Our camera transition is functional, but there’s a bug hidden here. First, if SwitchCamera attempts to switch us to the same camera, we’ll fade in/out for no reason. 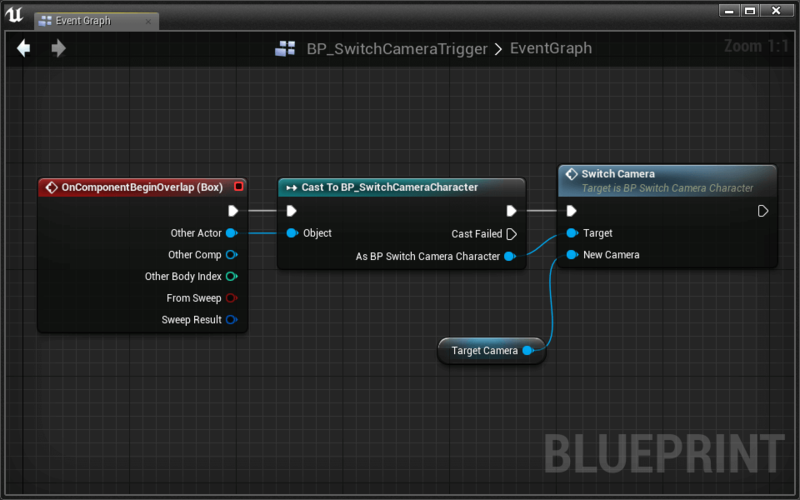 Insert a Branch in front of everything that checks whether or not CurrentCamera is equal to SwitchCamera > New Camera using ==. If it is, don’t do anything. Second, when we first start the game, we fade out from some unknown camera (it is in fact the player’s default camera), then fade back in to the one we want to start on. Let’s skip the undesired fade out from unknown camera at the beginning. The best way to skip the unwanted behavior is to check if the have a CurrentCamera. At the very start of the game, we don’t have a CurrentCamera and can thus choose to skip the fade to black and jump straight to switching cameras and fading in. We can check if we have a CurrentCamera using the Is Valid? node. 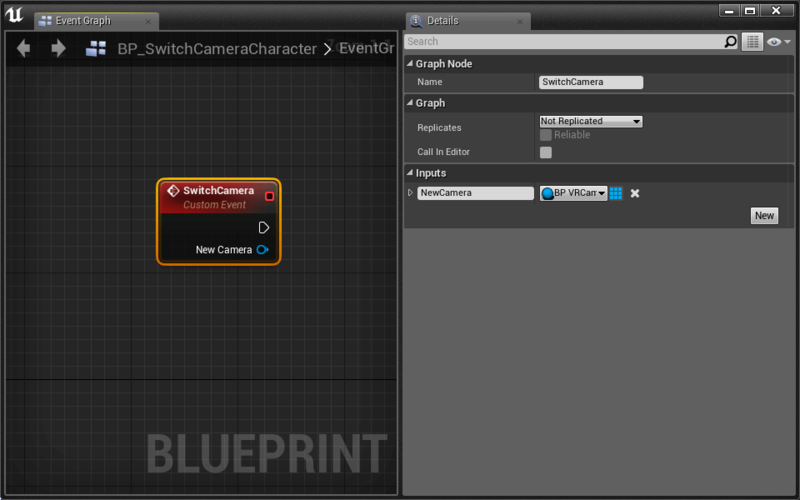 Connect a reference to CurrentCamera to Is Valid > Input Object. If the CurrentCamera Is Valid, we should continue on as normal. 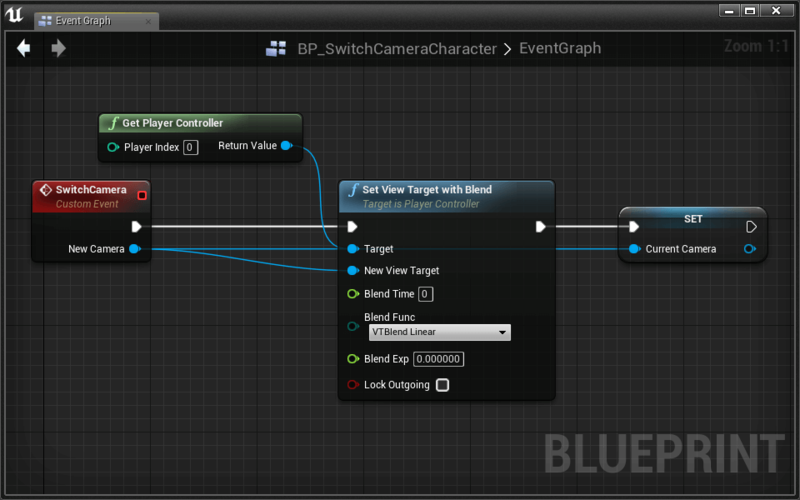 Otherwise, we should skip the fading part and jump right to Set View Target with Blend. Go ahead and press that Play button! The fading should work perfectly. Effective use of this character-camera relationship requires careful level design and good camera/trigger placement. Be thoughtful! You may have noticed that the controls aren’t entirely intuitive, and definitely don’t feel great when you switch cameras. There are a number of ways to improve the control scheme of this perspective, and with some tweaking, you can have it working exactly as you want. We’ll leave the implementation up to you. You now have 4 great locomotion/perspective demos. We’re going to take this as an opportunity to learn about loading new levels. By the end, you’ll be able to demo each map in one playthrough. To do this, we’ll put a “portal” at the end of each map that links each map together. 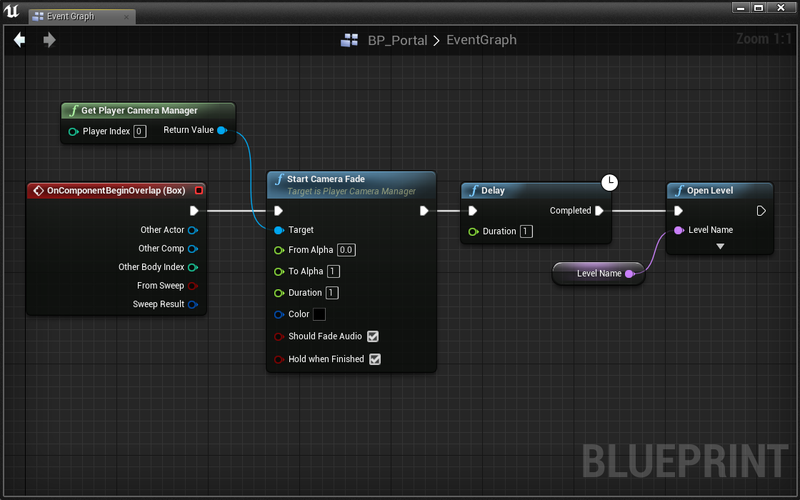 We’ve set up a blueprint in Lessons > Lesson4 called BP_Portal. It is currently just some static meshes and a public variable. Let’s make this portal load the next level for us when our character gets close. 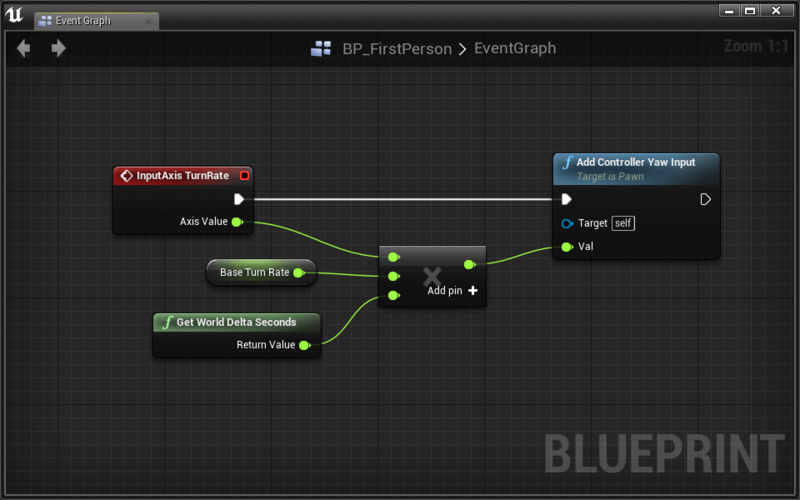 We first need to add a collision box that will fire an overlap event when our player gets close. This Box Collision can be used to fire an overlap event whenever our player collides with it. This is how we’ll know when to switch levels. A new event was added to our event graph! This event will only fire when the Box component is collided with. 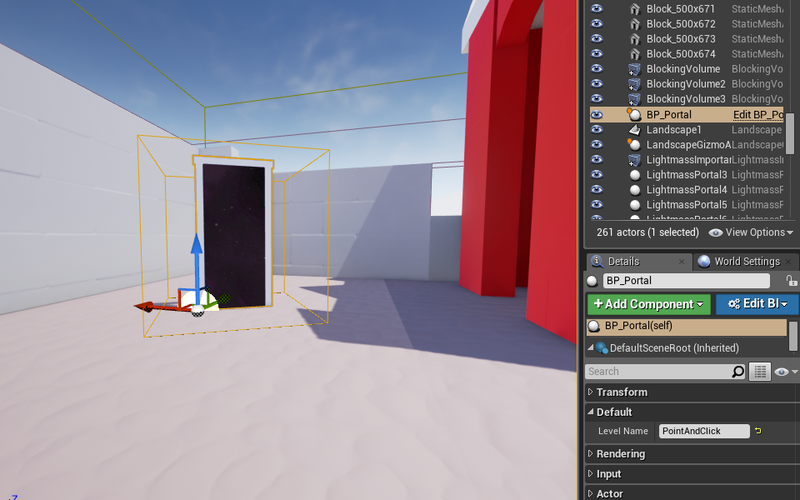 Using collision components like our Box Collision is an extremely powerful scripting pattern in UE4. You’ll find that you use it all the time to trigger events and behaviors. When the Box is collided with, we want to open the new level. 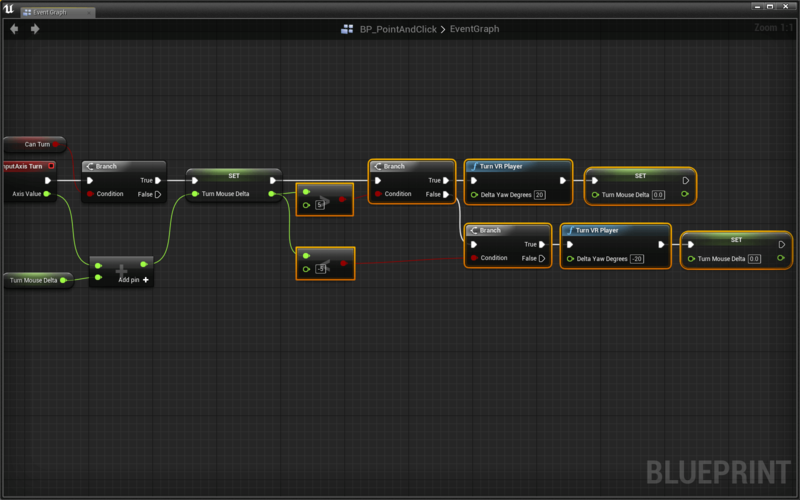 To do that, we use the Open Level node. 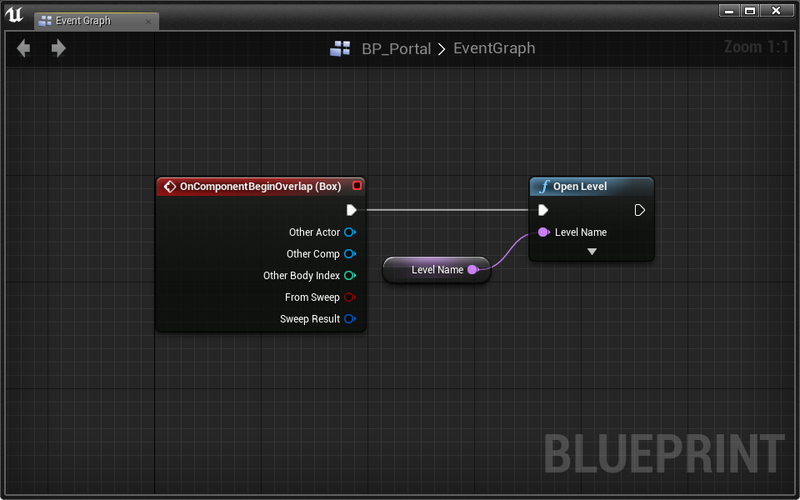 The Open Level node has a Level Name input. 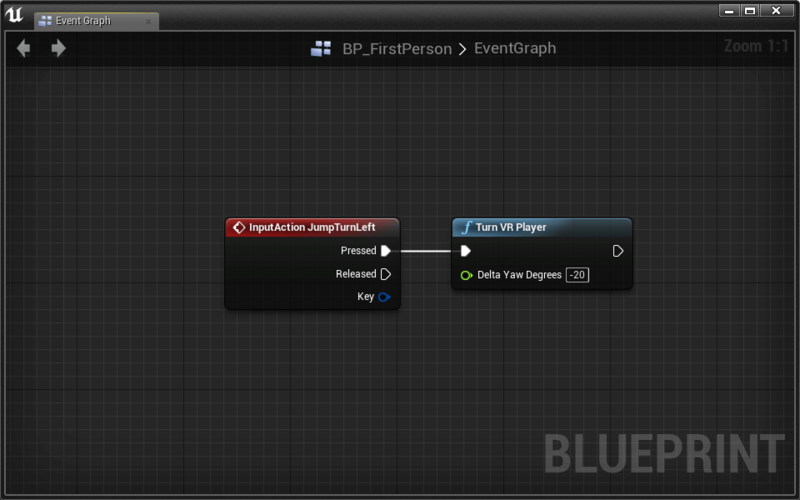 Here we’re going to use the BP_Portal’s public variable LevelName as its imput. Now we can reuse the BP_Portal, no matter what level we want to load. Press Play and test it out! Nice! 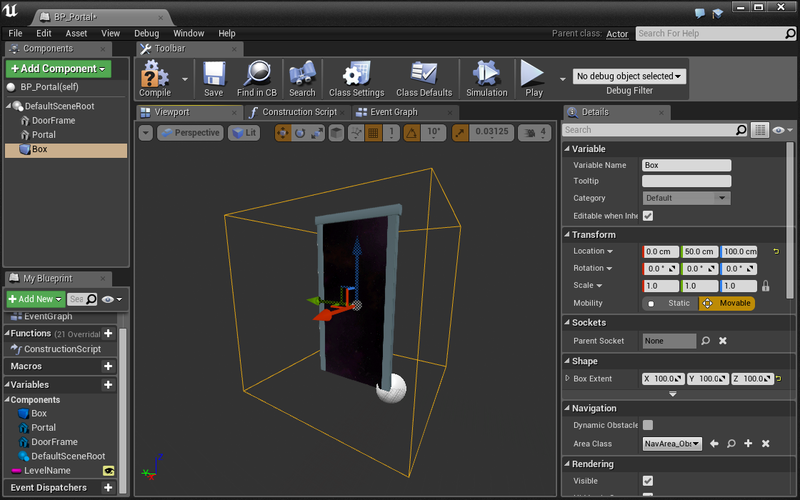 Now you can add the portal to PointAndClick and 25D. Just make sure each portal points to the next level. One thing you may notice is that when we switch levels, the engine tends to lag as it loads up the new files. A laggy HMD is a great way to make your player nauseas. To fix this, we should fade out, then back in, just like we did with the Stationary Cameras. In Stationary Cameras, we faded our camera out using a Timeline and the Set Manual Camera Fade node. 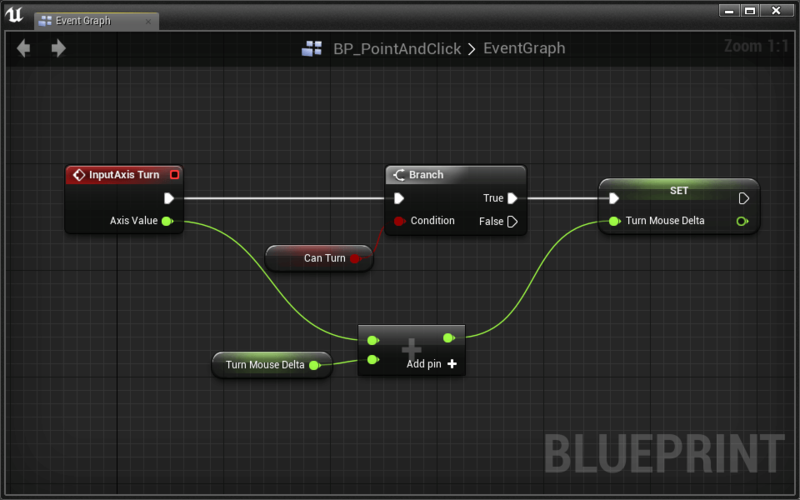 Rather than using a Timeline, let’s use UE4’s built in Start Camera Fade node. 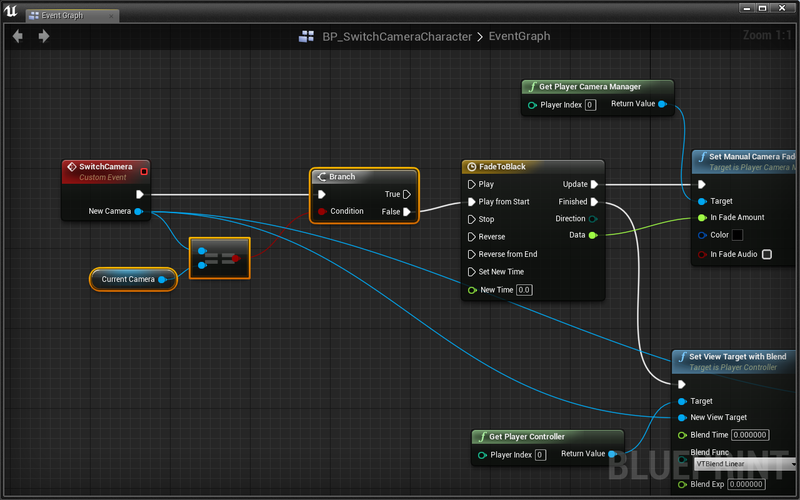 Use a Delay node to wait for the camera fade to finish. Then switch levels using Open Level. Marvelous! Now when we switch levels the current world fades out before switching to the new map. One problem, the new level needs to fade in! 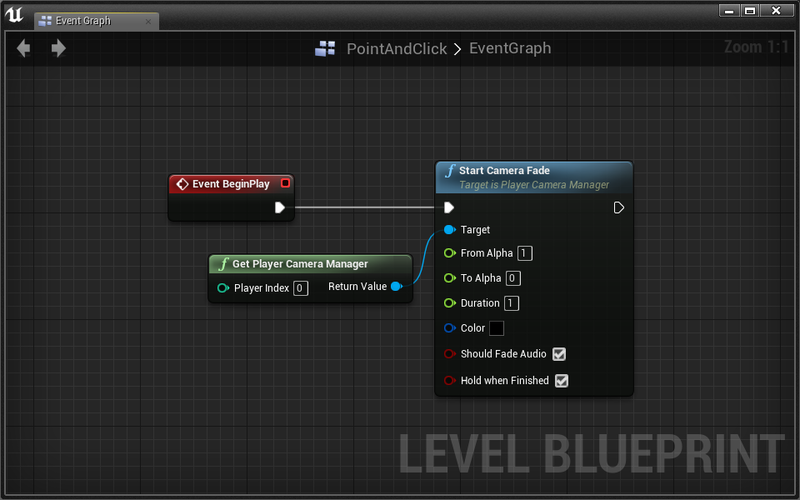 Using the Level Blueprint of each level, fade the camera in on Begin Play. There it is! All your levels should now link up and seamlessly fade between each other once you reach the portal at the end. We’ve created four characters with unique character-camera relationships. Some of these characters are more VR-friendly than others, but each has its advantages and disadvantages. VR is a vast and largely unexplored frontier. Our guidelines are only suggestions. This is your opportunity to experiment and innovate. To read more on suggested VR practices, check out the Oculus Documentation. In this assignment, you’ll create an experience in which the player travels from a Start point to an End point. Extend any of our VR-friendly characters, or create an entirely new locomotion/perspective scheme, to allow the player to navigate through the world to some specified destination. The player’s adventure should be interactive. The player must communicate with actors to move to new parts of the level. We’ll leave interaction implementation up to you, but tracing and overlap collisions provide more than enough functionality. 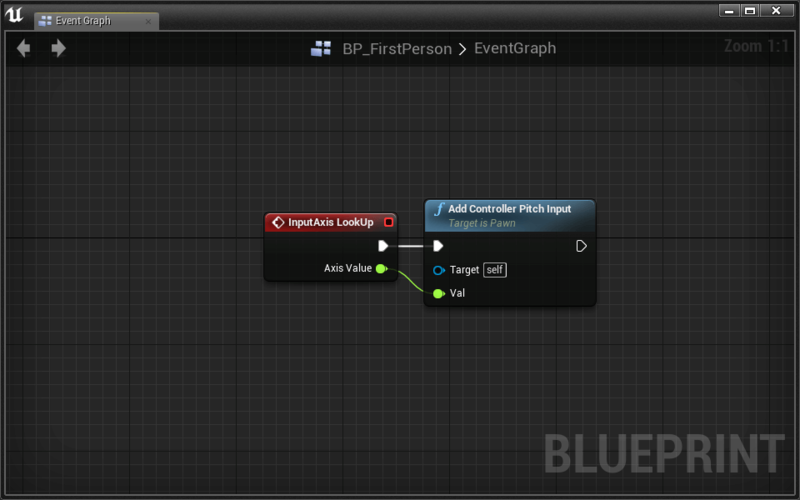 Create a Start point with a Player Start actor. 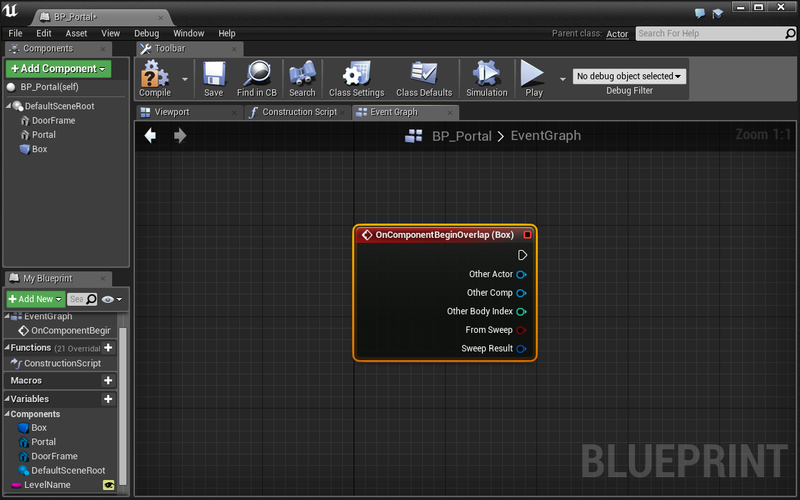 Create an End point with an “end game” blueprint similar to our BP_Portal. Make sure to fade the camera out before reloading the level! Traveling across the level may not be easy. If a player gets stuck, we should allow them to “respawn” without restarting the level. 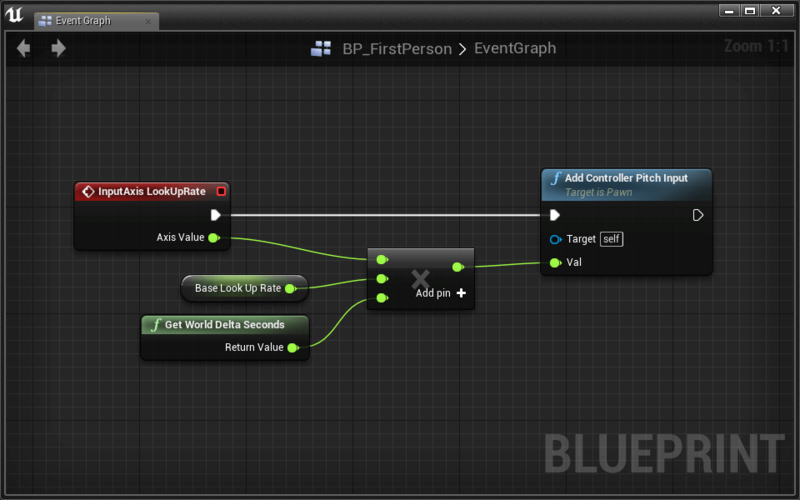 If the player can “fall off” the map, include a collision mesh blueprint that resets the player on collision.